Geschichte des fürstlichen Hauses Waldburg in Schwaben : Band 1 und 2 Im Auftrag Seiner Durchlaucht des Fürsten Franz von Waldburg zu Wolfegg-Waldsee. London: Grant Richards, 1900. Hardcover. Very Good. Hardcover. First Edition. 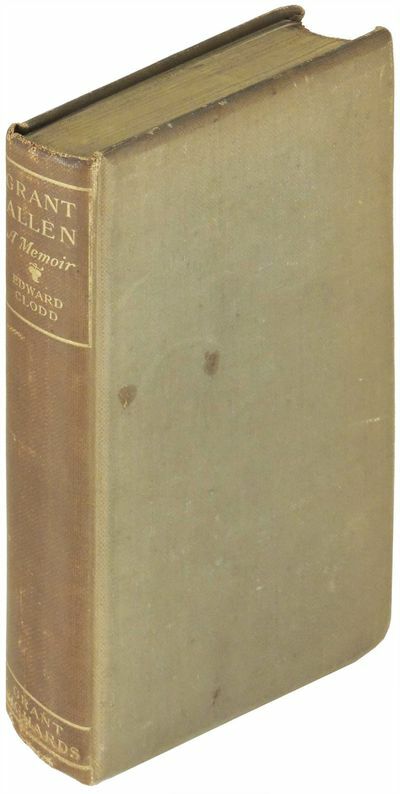 Presentation copy from Clodd, inscribed to the book's publisher Grant Richards, the nephew of Grant Allen. This memoir celebrates the life of Canadian science fiction author Charles Grant Blairfindle Allen (1848 - 1899). After teaching in grade school for several years, he became a professor of moral philosophy in Jamaica, where he developed his evolutionary system of philosophy. His literary career began with non-fiction essays on popular science, and he later went on to write nearly 30 fiction novels. He is considered to be a pioneer of the science fiction and detective fiction genres. 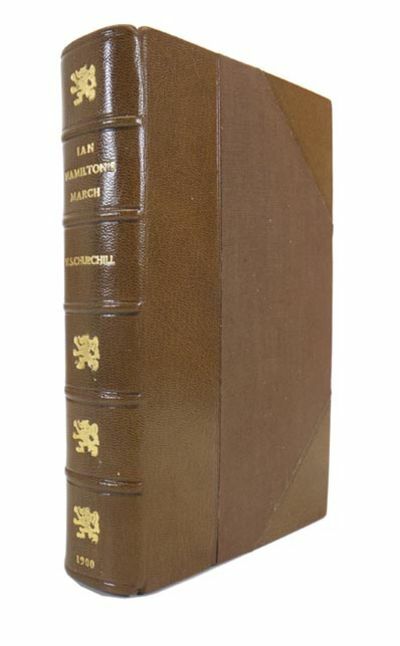 Bound in original dark brown cloth boards with gilt title to spine. Minor sunning to spine, small chip to foot of spine, and a few spots to boards. Offsetting to endpapers, else clean. 222 pages. LIT/052115. RUNAWAY PICTURES. Verses by Clifton Bingham. Pen-and-ink Illustrations by Florence Hardy. London: George Routledge & Sons, 1900. 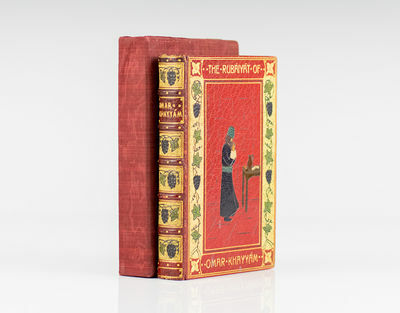 Small octavo, bound by Bayntun in full red morocco, central panel on upper cover with dark brown, tan, green, and cream onlays depicting a male figure within gilt borders with green and purple onlays of leaves and grapes, raised bands, gilt titles and tooling to the spine, the others with green and purple onlays of leaves and grapes, red silk doublures and endpapers. Housed in red cloth slipcase. Illustrated with 12 black and white plates. The Rub?iy?t is one of the most popular poems of all time. A collection of quatrains composed in the eleventh century by Persian poet and philosopher Omar Khayy?m, it was first published in English-language translation by Edward Fitzgerald in 1859. Since then, its melancholy tone and enigmatic philosophy of mourning the painful brevity of life while celebrating what pleasures we may find have made it an inspiration to countless people. New York: Manzi, Joyant and Company, 1900s. Leather_bound. Two volumes. Tall octavo. George Washington. The Memorial Edition is the First Limited Edition of twelve hundred and fifty copies which this is number 1011. Illustrations with two color frontispiece and 22 full page plates. 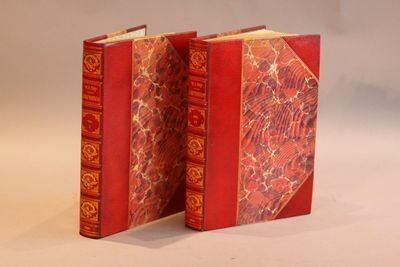 Bound in three quarter red morocco, spine attractively decorated with gilt stamped spread wing American Eagle and lettered in gilt, marbled boards, top edge gilt, Fine. Printed at the Chiswick Press 1900. Printed at the Chiswick Press: , (1900). Printed at the Chiswick Press (1900)pp + 12 leaves of leadwork designs onto which there are 15 real photographs in sepia which are pasted down. There are occasional manuscript prices and notes and prices in red ink and one in particular asking for enquiries to be addressed to Miss Veronica Whalls at Ravensourt Park. 4to. Original blue sugar paper printed wrapper preserved in outer cloth covered boards with lettering on upper board "Glazing by Whall". Bookplate of Claude Arthur Kirby on verso of upper wrapper.Signed in minute handwriting by Christopher Whall on the lower edge of the wrapper. Loosely inserted printed pamphlet on "Hall's Memorial Window for the Royal Military Academy Chapel, Woolwich". Hand written note from Whalls to "CK" [Claude Kirby] which is an invitation to view this window at Whall's Studio 20.21.2.22. Upper wrapper rather dusty. At the end of p22 of the text the address at Chelsea has been scored out in favour of the address at Ravenscourt Park. Rare. Veronica Whalls became a partner in the business in 1922 but was active much earlier. One version of Leaded Glazing 1900 located on World Cat. This item not located. Golf von Neapel mit Vesuv. Ölgemälde auf Leinwand, alt gerahmt. Balkan - Straßenhändler - Bronzefigur um 1900. Straßenverkäufer aus dem Balkan. Bronzefigur auf Marmorsockel. Um 1900. - Figurhöhe 23,5 cm, Gesamthöhe 27,5 cm. Ein Straßenhändler aus dem Balkan, Serbien, Kroatien, Bosnien, Montenegro, Griechenland o.ä. bietet Wanderstöcke zum Verkauf an, von denen er ein Bündel auf dem Rücken trägt. In einer Bauchtasche hat er verschiedene Kleinteile, darunter Material um Schuhe zu reparieren oder besohlen und Knäufe für Spazierstöcke, wovon er einen in seiner Hand vorzeigt. - Detailreich plastisch ausgearbeitete Figur aus Bronze mit Patina. London: Longmans, Green & Co, 1900. First Edition. Hard Cover. Octavo. Folding color frontispiece map, 498pp., (2)pp. advertisement for Churchill's The River War and The Malakand Field Force, 32pp. publisher's ads, 3 other maps (2 folding), and 4 plans. Bound in tan pictorial cloth stamped in black, lettering red and black, pictorial spine gilt and red, black endpapers with small booksellers embossed stamp to upper corner of front fly, neat owner's name and dated 1900 to upper corner of half-title; light scattered foxing to preliminaries; internally clean. A very handsome copy. New York: Frederick A. Stokes, (1900). 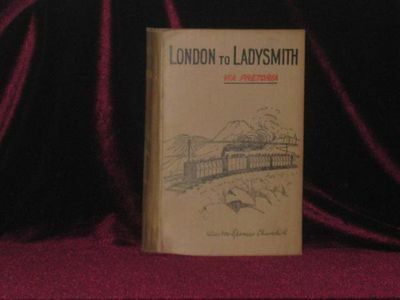 First edition.. Hardcover. Fine/Good. Maud Humphrey; Mabel Humphrey. Folio. 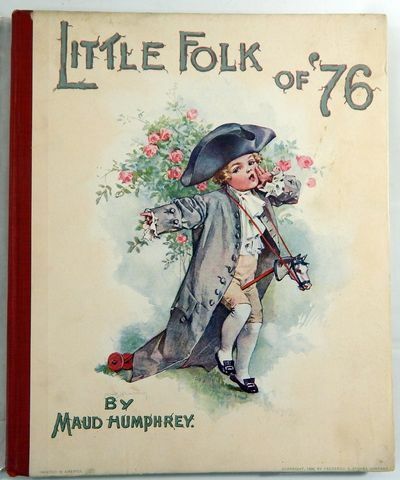 6 full page color plates (including the title page) by Maud Humphrey, plus in-text illustrations and text by Mabel Humphrey, all printed on one side only on heavy paper. The binding is a red cloth spine, printed paper boards both upper and lower showing "Paul Revere" on his hobby horse. This is a fine, bright copy with only traces of wear and soil, still protected in its rare dustwrapper. The dustwrapper has had extensive old repairs from within over time, including some tape repairs, and it lacks bits along the edges and folds, but it is still presentable. A surprisingly rare book, the more so in this condition, by the iconic Maud Humphrey, who trained, inter alia, under James McNeil Whistler. 1900 - 9 3/4x12in. Harry Fenn was an English-born American illustrator, landscape painter, etcher, and wood engraver. Fenn began his artistic career as a wood engraver but quickly switched to drawing for illustration and watercolor painting. His works as an engraver were first commissioned in 1867 (dated 1868) for Whittier's Snow-Bound published by Boston's Ticknor and Fields for the Christmas trade. He was a skilled and successful illustrator in the United States in the latter part of the nineteenth century, which was a time when illustrations in periodicals and books were the primary means of visual image sharing. He illustrated landscapes throughout the world, especially the United States, as well as recreated depictions of architecture and plant life. His enormous popularity informed the public about distant lands and led the middle class to appreciate printed pictures as works of art. Ian Hamilton's March. Together with Extracts from the Diary of Lieutenant H. Frankland a Prisoner of War at Pretoria. Das Automobil in Theorie und Praxis. Elementarbegriffe der Fortbewegung mittelst mechanischer Motoren. Autorisirte Uebersetzung von R. von Stern. 2 Bände. - WAIN,LOUIS. PUSSIES AT WORK. London: Tuck, no date, circa 1900. 8 1/2 x 11", flexible pictorial card covers, corner creased, light soil, VG+. Cats go to work at various trades: Carpenter, Kitchen Maid, Nurse Maid, School Teacher and more. Featuring 6 fantastic full page chromolithographs (including covers, one not repeated in text), 8 full page 2-color illustrations and 2 full page illustrations in brown. A title in Father Tuck's Nursery Tales Series. Scarce Wain title. Grosse Original-Tuschzeichnung von Josef Mukarovsky, unten links signiert. Ohne Ort, vielleicht München, um 1900. - circa 59 x 41 cm. 1 Blatt verso alte Vermerke und Etikett für den Druck "Bestimmt in Nr." Elegante, sehr grossformatige Zeichnung wohl für eine der Münchner Zeitschriften, für die der tschechische Künstler Mukarovsky (1851-1921) um die Jahrhundertwende arbeitete. Zu sehen ist eine junge Dame in einem Behandlungsstuhl, der ein neben ihr stehend - Gut erhalten. (London): 1900. (London):, n.d., ca. 1900. (London): n.d., ca. 1900. "Warings of Liverpool were founded by John Waring, who arrived in the city from Belfast in 1835 and established a wholesale cabinet making business. He was succeeded by his son Samuel James Waring who rapidly expanded the business during the 1880's, furnishing hotels and public buildings throughout Europe. He also founded Waring-White Building Company which built the Liverpool Corn Exchange, Selfridge's department store and the Ritz Hotel." (see: http://discovery.nationalarchives.gov.uk Ref. 2233). Around the time of this catalogue's publication, Waring had started partnering in business with the distinguished (and then ailing) furnishings firm, Gillows of Lancaster. In this particular catalogue a full page is devoted to a list of some Waring & Gillow contracts and another page lists the awards received by the "Amalgamated Houses of Waring & Gillow, Ltd"; Waring & Gillow was officially established in 1903. With showrooms in London, Liverpool, Manchester and Paris, the growing companies were expanding their reach. Underscoring that reach is the presentation of this almost encyclopaedic catalogue as only an advance on a complete catalogue made for the benefit of "customers residing at a distance". Hence the French chateau bookplate we find in the book. These "advance sheets" contain several examples of fully completed drawing rooms; clocks in various styles including Chippendale; and all variety of upholstered furniture. From the halls to libraries and bedrooms, there are illustrations of furniture appropriate for the sophisticated home. The bookplate of the bibliothèque du château de Valençay is on the front pastedown, along with two labels from the Warings firm, one identifying the catalogue as No. 520 (or 530? ), the other advising of an increase in prices. OCLC locates four copies, of which only one in North America. No copies in COPAC. Oblong 40 ( 26 x 36 cm); 240 + 20 pp. with numerous reproductions from black and white photographs and drawings + 8 pages of color photographs of carpets. Original quarter art vellum with cloth covered boards lettered in gilt, moderate scuffing and discoloration to covers; "Waring" inscribed in ink on plain art vellum spine; bookplate and two printed labels on front pastedown. In very good condition. Kleiner Leitfaden zur Erlernung des Kishambala. Von Fr. M. Erasmus Hoerner, OCR, Neu Köln bei Care, Westusambara, D.O.A. [Deutsch-Ost-Afrika]. Mariannhill, Natal, Südafrika, St. Thomas-Aquins-Buchdruckerei, 1900. - Dem unermüdlichen Förderer von Kultur und Sitte in Usambara, D.O.A. Herrn Bezirksamtmann Meyer in Wilhelmsthal, freundschaftlich gewidmet vom Verfasser. Brauner Halbledereinband der Zeit mit marmorierten Deckeln, 8°, 340 Seiten, 1 merfach gefaltete Tafeln , Seiten papierbedingt nachgedunkelt und leicht fleckig, sonst gutes Exemplar. Leipzig, Leipzig, Insel / Offizin W. Drugulin, , [Sarkowski, 1546]. 1900 - Halbpergament, gr-8°, 75 S., 1 Bl, zweifarbig, floral illustrierte Vorsätze von Heinrich Vogeler, Insel-Vignette auf dem Vorsatzblatt, Insel-Bütten mit großem Insel-Wasserzeichen, unbeschnitten; -kleiner Fleck auf dem Deckel, Kopf etwas gestaucht, einzelne Braunflecken. ?Erschienen im Verlag der Insel. 1900. Seperatabzüge in dreissig Exemplaren, davon dies No. 16". ?Gedruckt im Auftrag von A.w. Heymel für den Insel-Verlag in der Officin von W. Drugulin, Leipzig 1900." Mit einer handschriftlichen Widmung auf dem Vorsatzblatt; vermutl. : ?p.l. E. Matthes d. Verfasser." Evtl. ist der Maler Ernst Matthes gemeint, der 1908 für den Inselverlag tätig war und 1918 gefallen ist. Sarkowski 1546. Es handelt sich um eine der ersten Publikationen des entstehenden Insel-Verlages. Heymel war Schröders Cousin, dem das Buch auch gewidmet ist. Très rare carte d&#146;invitation pour l&#146;Exposition de l&#146;Oeuvre inédit de Félicien Rops. [Paris], Pellet éditeur, 9 quai Voltaire, s.d. (vers 1900) - Ephemera. Très rare carte d&#146;invitation pour l&#146;Exposition de l&#146;Oeuvre inédit de Félicien Rops (vers 1900). [FELICIEN ROPS] Très rare carte d&#146;invitation pour l&#146;Exposition de l&#146;Oeuvre inédit de Félicien Rops. [Paris], Pellet éditeur, 9 quai Voltaire, s.d. (vers 1900) Héliogravure d'après le dessin de Félicien Rops (une oie coiffée façon parisienne) en noir, texte imprimé en rouge. Dimensions de la carte : 14 x 11 cm. Papier d'Arches fort cartonné - cuvette bien visible. Parfait état. RARISSIME. Studien über die Hirnrinde des Menschen. Aus dem Spanischen übersetzt von J. Bresler. 5 Teile in 1 Band (alles Erschienene). Boston: Dana Estes & Co, n.d. (c.1900). ILLUSTRATED CABINET EDITION. 26 vols., 7-7/8" x 5-1/2". Bound in dark 1/2 blue morocco, ribbed gilt decorated spines, top edges gilt, others uncut, hinges fine, head and foot of spines fine. 1900. WINSTED SILK COMPANY. Potter's Embroidery. Wash Colors. 8 panels containing 144 colour silk thread samples in a spectrum of vibrant colours, flanked by colour names and numbers. Oblong 16mo., 225 x 75 mm, folded accordion-style in publisher's embossed dark green cloth. West Winsted, CT: Winsted Silk Co., [ca. 1900]. |~||~||~||~| Catalogue of coloured "wash silks" exemplifying the Victorian colour palate, in salesman's sample book. Winsted Silk Company was founded in 1874 by Eugene and Oscar F. Potter with J.J. Lawler. The company name quickly became synonymous with the best grades of spool and embroidery silks manufactured in the U.S.
N.p. Privately printed, N.d. 1900s. Full leather. Sixteen volumes. Octavo. The Book of the Thousand Nights and a Night, a plain and literal translation of the arabian nights entertainments and with Supplemental Nights, to the book of the thousand and one night with notes anthropological and explanatory by Richard F. Burton. The Baroda Edition is limited to nine hundred and fifty sets which this is number 117. Privately printed by the Burton Club. Seventy-one plates including frontispiece coloured and copper-tone illustrations to set with title tissue guard. 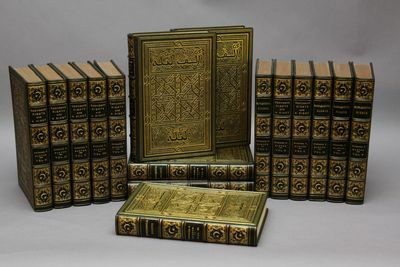 (Ten volumes of The Thousand and One Nights and Six volumes Supplemental Nights). Volume one contain a tipped in autograph letter signed Burton. scrolling and interlacing tendrils, and gilt arabic text to boards reads Alf Laylah Wa Laylah, top edge gilt, spine in six compartments between raised banding, second and fourth compartments gilt title, the rest in gilt decorations of dense scrolling patterns and with a quarter moon and a star, marbled endpaper. A lavish binding in very fine condition. Fine. Sur la loi de disjonction des hybrides. SS. 845-847. In: Comptes rendus. de l'Academie des sciences. Band 130. Buschiri, der Feind der deutschen Kolonien, oder der Aufstand in Ostafrika im Jahre 1888. Eine Erzählung für die Jugend. Mit 9 Bildern. Boston 1900, Little. FIRST EDITION. Blue decorated cloth,. edges uncut, 268p., 5 b.w.illustrations, very good, 12.5 x. 19.5 cm., clean, sharp, solid copy, dust jacket in mylar. protector,chipping some loss, but still RARE ! FIRST EDITION. Contents: Stories from strange books: The Reconciliation; A Legend of Fugen-Bosatsu; The Screen-Maiden; The Corpse-Rider; The Sympathy of Benten; The Gratitude of the Samebito; Japanese Studies: Semi; Japanese Female Names; Old Japanese Songs Fantasies: Noctilucae; A Mystery of Crowds; Gothic Horror, Levitation; Nightmare-touch; Readings from a Dream-Book; In a Pair of Eyes. *** With five lovely illustrations. The book covers were designed by Bruce Rogers. * REFERENCES: BAL 7935 * P.D. 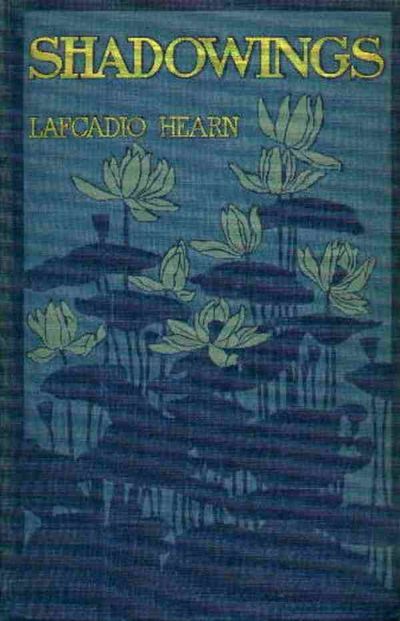 Perkins & Ione: LAFCADIO HEARN A BIBLIOGRAPHYOF HIS WRITINGS, p.40. * Color scans can be sent by email. Images displayed may not always be the exact photo of the copy in stock for sale at any given time. If you want to see the exact image of the book or edition in stock today, please request this by email. . Photos of most of our books are posted to our . [Paris - Weltausstellung 1900 - Fotografie]. Album mit 70 auf starke Kartonbll. mont. Orig.-Fotografien (ca. 22 x 27,5 cm).